Andrew Walters is an Edgecombe County native and spends much of his time pursuing wild game and fishing across eastern North Carolina with his family and his fiancé, Noelle. His passion for the outdoors was the driving force that led him to North Carolina State University where he earned a Bachelor of Science degree in Fisheries, Wildlife, and Conservation Biology with a concentration in Wildlife Science in 2014. He was the President of the NCSU Quality Deer Management Association club and continues to be an avid member of QDMA. After graduating, he earned his real estate license and joined the Mossy Oak Properties NC Land and Farms team in Greenville, NC. He is a freelance outdoor writer and has had a number of featured articles in the Wildlife in NC magazine, as well as, Mossy Oak Gamekeepers. 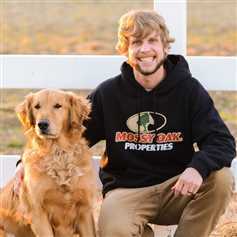 Andrew is also a major contributor to the Mossy Oak Properties NC Land and Farms weekly blog, the Management Minute.